There are lots of different ways we can partner up and work together. I provide services as a freelance chef, recipe developer, writer, photographer, on camera personality and live host/emcee. If interested in these services or others, please contact me at ColeyCooks at gmail dot com (I have to write it this way to trick the spambots). I have professional training and over 10 years of on camera experience, including plenty of live television. I’m best known for being second runner up on season 10 of the reality TV competition show, Food Network Star, which aired for about 11 weeks during the summer of 2014. 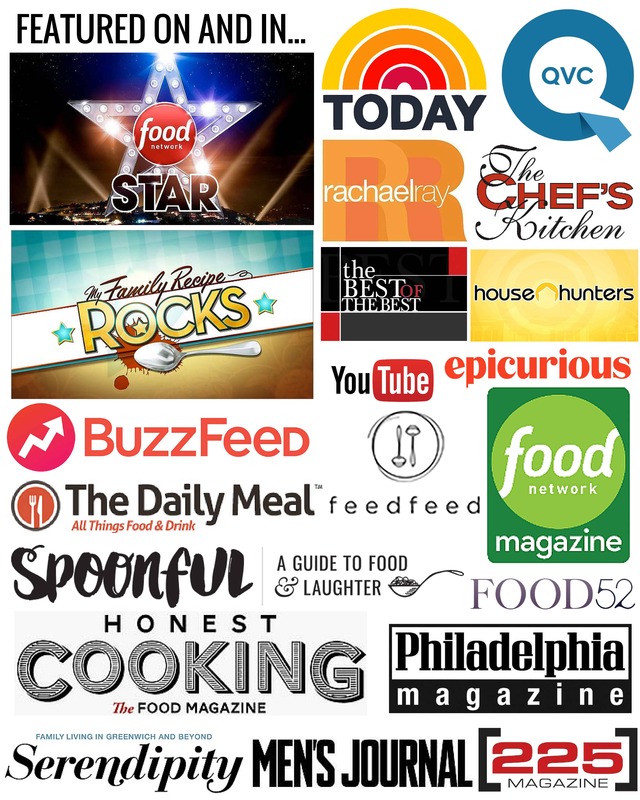 I’ve been hosting the long running, syndicated Philadelphia based cooking show, “The Chef’s Kitchen,” since 2012 and continue to make regular appearances on QVC. I’ve performed live cooking demonstrations on The Today Show and The Rachael Ray Show, and have appeared on House Hunters and My Family Recipe Rocks with Joey Fatone. I post new cooking and gardening videos to my YouTube channel every week, and I work with multiple brands to feature their products in cooking videos, commercials and infomercials. If you’re interested in sponsoring one of my videos or having me appear on camera for another project, please contact me at ColeyCooks at gmail dot com. I would love to make an appearance or represent your brand at the next festival, conference, trade show, fundraiser or other live event. I’m available to perform live cooking demonstrations and lessons, host or emcee events, judge cooking competitions, speak on panels, prepare and serve food and represent brands at booths. I’ve performed numerous live cooking demonstrations and emceed events at the Greenwich Food + Wine Festival, Philadelphia Food, Wine + Spirits Festival, Atlantic City Food + Wine Festival, Imperial Palace in Biloxi, MI, Lancaster Food, Wine + Spirits Festival, Atlantic City Beer Festival, Atlantic City Seafood Festival. I have represented brands at the Boston Seafood Expo and New York City Produce Show, and have been the guest celebrity chef at a number of fundraisers and functions. In addition to appearing live and representing brands, I’m also available to provide live media coverage, promotions reviews of your event, sharing my experiences through posts and social media. To book me for your next live event or learn more about the services I offer, please contact me at ColeyCooks at gmail dot com. I work with multiple companies to produce quality, professional content in a number of different formats. If you think your brand or product would be a great fit with my readers, I’d love to discuss how I can work with you for a one-time sponsored post, or as a Brand Ambassador on an ongoing basis. I write and photograph a monthly feature called “Recipe Box” for a local publication called FLAVOR Magazine. My recipes, writing and/or photography have been featured in Serendipity Magazine, Spoonful Magazine, Honest Cooking, Buzzfeed, The Daily Meal, Epicurious, Food 52 and The Daily Meal. If you have a product you’d like to send me, I’ll be happy to give it a try, but unfortunately I do not accept products in exchange for coverage, as recipe development, photography and writing take a significant amount of time. If you’d like to become a sponsor, please contact me at ColeyCooks at gmail dot com. If there’s a way you’d like to work together that you didn’t see listed here, I’d love to hear from you! I am currently the Corporate Chef and Brand Ambassador for Australis Barramundi (learn more here) as well as a brand ambassador for Finlandia Butter and Cheese. I’ve worked with the following companies in a variety of different ways: Dream Almond Beverages, Castello Cheese, Wild American Shrimp, Santa Rita Wines, US Potato Board, Tomato Wellness Board, Perugina, Colavita, Bristol Bay Wild Sockeye Salmon, Santa Sweet and UlgyRipe Tomatoes, Olive Oils of Spain, Dorot Herbs, Rosa Foods, Folie à Deux Wines, Badia Spices, Rastelli Foods, Egg Harbor Seafood, Philip’s Smoke-Less Indoor Grill, Feliz Latin Produce, Audi and more. For more information and examples of my work, please contact me at ColeyCooks at gmail dot com.